2017 NH Business Energy Education Series: Vol 9 – How Do I Incorporate “Efficiency” Measures in My Energy Plan? How do I Incorporate “efficiency” Measures in My Energy Plan? Answer: Start everywhere. I’m not talking just energy efficiency here, I mean everywhere. I have never seen a business not benefit from becoming more efficient. In many businesses, getting “more efficient” on energy usage should be last on the list of getting “more efficient”. My 1998 office building was very efficient in 1998, but today I could do so much more with the changes in available building technologies and pricing. However, at less than 1% of my annual costs of operating my business, it would not be 1st on my list of areas where I could move more profit to the bottom line with increased efficiency. I think that kind of high level view should be taken first by every business. If energy costs are important to your bottom line, then it is important enough to take seriously by improving your energy efficiency. It has been proven over the past 30-40 years that energy efficiency is one of the, if not the most, cost effective means to lower energy costs. That is precisely why most every state operates energy efficiency programs inside and outside of their regulated electrical distribution system operators (i.e- your local electric utility company). These state driven initiatives are a great first step for any company wishing to explore the prospects of some financial assistance or rebates provided for technical assistance and efficiency measures. Of course you are 100% able to take a much more aggressive approach than these sponsored programs do. However, it’s worth seeing if you qualify for NH assistance that you are already paying for in your NH electrical energy rates and your NH tax dollars. Essentially, most companies would find it beneficial to consume less energy first through the implementation of cost-effective efficiency measures BEFORE adding self-generation so that the new electrical “generator” would be sized closer to the actual need and/or optimum payback point. That same approach is taken today when people pursue a Zero-Net-Energy project of any kind, using efficiency first to lower the energy use to an optimum (cost benefit) level before adding self-generation to get to a zero or near net zero level. My only caution would be to not throw some options away too fast if they don’t fit neatly into your company’s financial payback criteria. I know that is harder to do if you are answering to Wall Street every quarter. There is most always some low hanging fruit (ex.- lighting) that is easy to grab, but don’t lose sight of the long time period that these improvements provide an annual savings, as well as raising plant value. Not everything is going to fit into a simple 2 year payback analysis, so maybe a more robust alternative ROI examination is worth another view before setting it on the shelf. Here is a short story from NH’s Worthern Industries about measures they have recently undertaken, for example, under a 5 year payback. 2017 NH Business Energy Education Series: Vol 8 – How Do I Develop My Own Company Energy Plan? The most important step is to start. Another way to take a big picture 10-step approach is outlined here, its a little dated but they give you a lot of sources to help educate yourself. You get the idea. Again not to endorse, but in Vol 1 we pointed you in the direction of Usource who can function as a fuel or power buyer for you, as well as a whole list of energy services like load shifting and self generation. Freedom Energy Logistics is an independent New Hampshire based company that has extensive experience in putting a company on track to save money on energy use and purchasing. I’m not saying you can’t get there on your own, with the right in-house people you can. However, most companies run lean enough that the people they already employ can’t carve out the time to do these things, as well as their regular jobs. The professionals in this field have the resources and experience to move you along quickly, and again as noted in Vol 1, time is of the essence to negate those rising electrical demand charges. In a later Volume we ask you the question: How much do I really care about my energy costs? If your answer is “a lot”, then go ahead and see what you can do about. What makes for good business on both a technical level and on a financial level? If energy costs significantly impact your bottom line, then with other like matters, get aggressive and protect yourself …….you really can’t afford to wait for someone else to do it for you! If your answer is “not much”, as it would probably be for lots of non-manufacturing businesses, making a good lighting retrofit or boiler replacement might still be a good fit ….. keeping with the life cycle of those existing building components. If they are less than five years old and work well, don’t give it a thought. If they are more than 10 years old and have had some performance or maintenance issues, they are worth evaluating to see what the payback would be to upgrade to new technology now. Likewise, if they are 20 years and older, time to take a good hard look at what you and what you should do for replacements. Whatever you already have won’t last forever, so its not a matter of “if”, its a matter of “when” some things will have to be changed out. For example, we operate a 15,000 sf office building built in 1998, soon to be coming up on 20 years old. When it was built, it was ahead of where the codes would have dictated, as it relates to energy use. Having said that, we have some replacements scheduled for 2018-2019 …… many of which relate to electronic control systems (HVAC and lighting) caused by technology obsolescence rather than just efficiency. Hopefully, there will also be some energy efficiency gained at the same time. However, our outdoor parking lot lighting is already prime for changing over to LED fixtures. In today’s buildings, anything operating with the equivalent of its own computer is subject to obsolescence due to continuous hardware and software changes in the industry. At the end of the day, our total annual costs for fuel and electricity are less than 1% of our total cost of operations, which is dominated by the cost of our people and not our physical plant. Its hard to get business owners fired up about energy use if it is a small part of their annual budget. 2017 NH Business Energy Education Series: Vol 7 – Will One New Pipeline Project In NH Fix The Problem Of High Costs? Will One New Pipeline Project In NH Fix The Problem Of High Costs? Answer: Maybe …. some. There are links below so you can read about the proposed Access Northeast Pipeline connecting to the proposed Maritimes & Northeast Pipeline in greater depth. We have existing retail distribution pipelines in New Hampshire which provide limited access to natural gas in portions of the southern part of our state to Liberty Utilities (90,000) and Unitil (30,000) customers, per NHPUC 2014 data. When it comes to fuel costs/btu, few would argue that natural gas doesn’t have the obvious alternatives (oil, kerosene, propane, coal, and wood) beat most of the time on both simplicity and price. The real exception has been during winter constraints in the pipelines occur during extreme cold weather periods when natural gas can spike due to competition with gas fired electrical generation use. The historical problem (prior to the gas generators) was lack of access …… you either have a pipeline available in your area to tie into or you don’t. As mentioned before, recently increased winter LNG tanker availability into Boston, to backstop the pipelines, was intended to help mitigate the winter peak natural gas conditions. Many companies have also opted for duel fuel capability equipment, so they can switch away from a fuel source that may experience temporary supply or pricing problems (like natural gas or propane). Today, oil can be easily stored on-site as a back-up fuel to pipeline gas, and in the future you can expect LNG to offer the same kind of cost based fuel switching. You can’t sell what you don’t have. That is tone problem retail suppliers (Liberty & Unitil) have had …….along with of course the periodic price spikes, mainly experienced back in 2014. In the complex supply chain of natural gas, there is always a premium to be had for guaranteed rates and guaranteed supplies. This is not an area small companies can easily play in for their heating demands alone. When large volumes of gas and process heat requirements enter into the equation, businesses have some buying power. If you take gas fired electrical generation out of the equation, the supply problems and price spikes go away …….. but so does the clean energy they offer to the region. Now comes the thornier problems alluded to in Vol 2: who takes the financial risk for the costs of building new pipelines ………… the provider or the consumer? And if you want to double down on risk ……… what consumer (if any) takes the risk, gas consumers or electrical consumers? Putting it another way, how much of any new pipeline capacity should be allocated for new gas fired electric generating plants versus expansion of the use of natural gas as an end user fuel source? I think we are now into some uncharted waters. Compared to other New England states, New Hampshire has been slow to embrace the use of energy efficiency as an alternative to building more energy supply capacity. As pointed out previously, ISO-NE has already observed and modeled the fact that energy demand is not increasing ……..and they are projected it to hold steady at about 130,00 GWH annually through 2024. Energy efficiency investment (demand side management) has proven itself to be the most cost effective method of reducing electrical demand, and this is already reflected in past and future changes to our building codes (future Vol). Beyond codes, we also find education and adoption of new initiatives like (ZNEB) zero net energy buildings, that produce as much energy as they use (future Vol) making an impact. 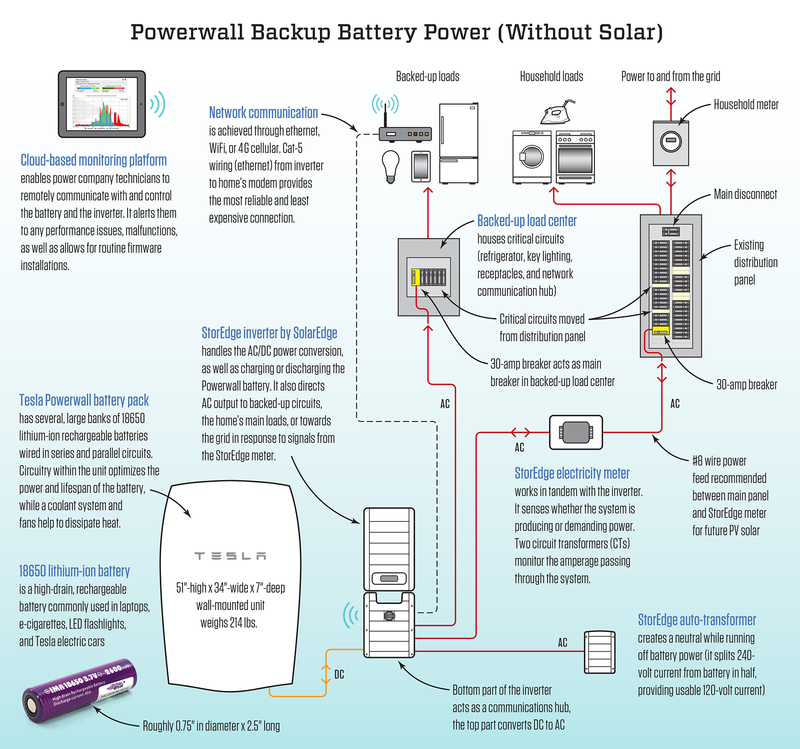 Adding in new technology in battery storage, we already see pilot projects by electric utilities where every home on the test grid is being fitted up with Tesla Powerwalls with and without solar PV installations, as a means to load shift the demand curve. Heat pump technology is also radically infecting the market for space heating, and for hot water heating alternatives that are far more efficient than previously thought possible. I could go on…….and on. Other new NH studies make the case that new pipeline capacity is not needed at this time for continued economic growth in New Hampshire, due to the yet untapped potential for greater efficiency and renewable energy growth in the state. This is a strong case that was never fully vetted in this way before now. Simply put, the business community should be in general support of the prospect of more natural gas supplies making it into New Hampshire. As a lower cost, clean burning fuel, natural gas offers benefits not found in oil or propane alternatives …. and offers a sound base for firing heating systems and CHP options. However, pipeline investment risks should remain with the pipeline developers ……… especially in New Hampshire, as all of the proposed new gas fired electrical generating plants in the Access Northeast plan are located in Connecticut and Massachusetts, not New Hampshire. New Hampshire natural gas customers will pay for increased costs for pipeline expansion when they purchase their supplies through their retail supplier, but large users may also find access to new sources/options to mitigate those increases if capacities were increased. It remains to be seen just how important natural gas fired electrical generating plants will become in the future when they have to compete on the pricing side of gas supplies that are headed for higher value LNG export opportunities. 2017 NH Business Energy Education Series: Vol 6 – How Will The Future Electrical Energy Grid Affect Me? How Will The Future Electrical Energy Grid Effect Me? Answer: That all depends upon you, but probably a lot. This topic is so vast, I’ll need to give you some reading material via links along the way to “educate” you, which is the whole purpose of this series in the first place. “First, a couple of basic principles. The distribution end of the grid is becoming much more complex. We are introducing distributed and community-scale generation, energy storage, and even new significant loads (EVs, for example). This could potentially be quite destabilizing for the substation-and-upward utility at high saturation levels, hence the (in my opinion, much overwrought) concerns about rooftop solar. But these new factors are all potentially networkable and thus controllable, or at least able to be monitored and adapted to in real time. The utility distribution grid workforce is becoming older over time, and is also under increasing pressure from more erratic and severe weather events. Backfilling the workforce accordingly would be extremely expensive without relying a lot more on automation. So there will be more automation. Finally, as the overall utility grid operator is increasingly under pressure to keep everything balanced while attempting to manage an aggregation of increasingly variable yet oft-correlated distribution nodes, they will turn even more to pricing and incentive schemes that encourage load stabilization at the node level, as well as capacity-on-demand when needed from one node to another. To the extent practicable, each building becomes a grid-tied microgrid, with on-site distributed generation and load control, and, in the larger buildings, storage. “Microgrid” means a lot of things to a lot of people, but for me what it implies is that the building is (again, to the extent practicable) self-sufficient and under a single, intelligent control system. Of course, many buildings will not be appropriate for solar on the roof. But where natural gas is available and the need for thermal energy is relatively significant, combined-heat-and-power (CHP) systems will be utilized. CHP systems, in fact, have an advantage over solar DG in that they can be fired when needed, whereas with solar, the sun shines or it does not (hence all the interest lately in storage). A rare few buildings owners will even opt for other forms of distributed generation such as solid-oxide fuel cells or small-scale wind. Point being, there are a wide variety of DG options that will be increasingly placed on-site. But at the same time, not every building will be “net-zero energy” or such. That’s OK, but overall, there will be a lot more generation capacity at the building level. But whether or not the facility has distributed generation, it will have a networked load monitoring and control system (NLMC) integrated into as many intelligence-enabled loads as possible within the building. What are loads? Same as always (with one big exception). Lights, air conditioning and heat, industrial equipment (in the case of commercial & industrial, or “C&I”), appliances, and entertainment/IT. For the most part that’s about it, which seems simple, but it actually hides a huge amount of variation in terms of what loads look like, how readily they can be adjusted as needed, and how they should be prioritized. The goals of this NLMC are to 1) keep the building’s overall impact on the node as stable as possible (with few spikes and drops in net demand); and 2) enable sharing excess capacity back to the overall node when called upon to do so (often described as “automated demand response,” or ADR). So let’s break out C&I from residential-type buildings. C&I buildings, of course, come in all shapes and sizes, but what they all share in common is that they are all operated for a purpose other than just habitation. This means there are times when you need to run a piece of equipment even if the electricity cost is high. This is simplest to think about in office buildings, where there needs to be sufficient light and comfort and plug-level capacity for me to sit here on a cloudy day and bang out this column on a computer in a well-lit room without sweating all over the keyboard. But it gets really complicated when you take that same principle to a metal foundry or a food processing plant. If the goal is to stabilize facility impact on the node, this is hard to manage in such environments, even before you put solar on the roof and have to deal with what happens when clouds pass over — much less addressing how to control an on-site battery. Thus, what is needed in C&I is a robut NLMC that can handle a really wide variety of loads, integrate into whatever DG is on-site, even integrate into on-site storage. Able to handle not just simple HVAC controls, but a huge variety of industrial loads as well. And to smooth it all out on a real-time basis, via an ability to control loads in a buildings-owner-specified prioritization scheme. And to utilize that same prioritization scheme to feed capacity back into the node for ADR with minimal impact on facility operations. One single system that can be rolled out across just about all C&I facilities, so there’s a consistent solution for the utility to tie into. I’m biased of course, but I think this unnoticed development from Powerit Solutions is actually a really big deal in this regard. Whether Rob is spot on in his analysis of the future grid or not, you now have a better sense of what is transpiring in the electrical grid modernization/transformation world outside of New Hampshire. The future electrical grid will not be your father’s grid. It is changing quickly despite the industry’s lack of appetite to change. Why?, technology and customer demands. Just as our lives and our businesses have experienced rapid changes due to technology, so now is the electrical industry. They aren’t too happy about in general, as it was not too long ago they were all regulated monopolies for energy supply, distribution, and transmission. This transformation into a decoupled system of electrical generation and wires means they have to learn how to operate in the new world of a modernized grid, and change is not embraced by all because it means you have to learn to operate under new models of profitability. Take a quick look at the owner of the largest power project in New Hampshire (seabrook), NextEra Energy, whose subsidiary is the regulated utility Florida Light & Power, the third largest electric utility in the United States. According to NextEra’s website: “In 2015, we generated more electricity from the wind and sun than any other company in the world“. Not all energy companies can be a NextEra, if they were we wouldn’t have much competition in the marketplace they would be so big. However, they will give you further insight into the changing world of the electrical grid. 2017 NH Business Energy Education Series: Vol 5- Why Should I Care About Net Metering Of Electricity? Why should I care about Net Metering of electricity? Answer: It is your lifeline to competition in electrical energy. Net metering is not a thing so much as it is a process, and in the middle of that process is a smart meter that measures and records electricity flows in two directions ….. into your business from the host utility, and out of your business to the host utility. Without a smart meter you don’t have “net metering” because any power you produce at your plant and send out to the utility to use on its distribution system won’t get measured and credited to your account ….. and why would you want to do that? There are lots and lots of places to learn about net metering (just click on any of the links), but we are better off talking about why net metering matters to your business today. I alluded to some of the value of self generation in Vol 1, especially as it pertains to lowering your high energy demand curve that your utility charges you for 365 days a year ……. and that is HUGE for commercial and industrial rate payers. However, you could also do that without being a net metering customer if your internal use always exceeded your self generation, you wouldn’t care about net metering so much. But……… most plants don’t operate 7 days a week, and on the days you aren’t running a shift or occupying your building, you may still be generating power with solar panels or a CHP system……… and you will want to get credited for the power you make and send out to the grid. Additionally, your optimal power plant sizing (solar PV panels, CHP, etc …whatever you have) may in fact exceed your internal use at times during the day ….. and you will want to get credited for the power you make and send to the grid during those times. Basically, if you are going to generate some of your own power, there is no reason not to sign up as a net metering customer to make sure you see the most value (ROI) from your installed system. What else happens when you self generate and net meter? Your own generating asset (with a life cycle in the 25+/- yr range or much more) provides you with increased stability for your total cost of power on an annual basis for a long period of time. Your own generating asset also creates “price competition” on the energy supply side of the utility industry because they now have to compete with the costs of your self generation, not just other utility scale generating plants. Your own self generation can also augment your “stand-by” or “back-up” generator capability when the grid goes down. Your own self generation as a “distributed energy resource (DER)” aids in “grid stability” and “grid reliability”, as well as “grid security” ………its much harder to take down an electrical grid when it is composed of hundreds or thousands of of DERs. We’ll get deeper into this last topic in later Vols. In your own line of business, changes in technology results in “changes in the game” for you all the time. The same is true for power and power systems. Twenty five years ago everyone would simply laugh at you if you talked about adding a PV system to your plant or office building because they cost so much ……..pretty soon they may laugh at you if you haven’t, that’s how much and how fast technology is changing the game in solar energy supply. The next frontier will be energy storage, both on the grid itself and at your own location (Vol 12). I’m sure you have heard or read about the new Tesla storage batteries, but they are not alone. The power of the sun is not the only game in town, but it has seen the biggest and fastest changes on an applications level over the past 10 years. I have been net metering for over 5 years, and just during that time alone the KW output/sf of solar PV panels has increased 50%. CHP use is projected to grow as well, with more and more equipment suppliers entering the market to offer newer packaged products at a lower price point. Although not as simple and easy as popping PV panels on your roof or clearing trees for a solar PV farm, CHP can be very attractive for plant operations that can take advantage of the thermal (heat) by-product for process or central heating and cooling. Net metering is important to maximize the value of your self generation investment. ISO-NE’s 2017 forward capacity auction was just completed (FCA#11) and system resources needed for 2020-2021 not only were easily filled, but the resulting system wide clearing price of $5.30 per kilowatt-month was lower than the previous year’s auction (FCA#10 @ of $7.03/kw-month), which is the lowest clearing price since the floor price was eliminated in the 2013 auction. Just remember, those lower prices don’t start until sometime in 2020. ISO-NE reported that their forecast for 2020-2021 includes 720 MW of behind-the-meter self generation in New England from solar PV growth alone. A recent study by the Retail Industry Leaders Association (RILA) and the Information Technology Industry Council (ITI) concludes that “U.S. states that are investing in clean domestic energy production are also the most likely to attract major businesses, creating thousands of jobs in their communities” and that “retail and tech companies, such as Amazon, Apple, Facebook, Google, Microsoft, Target and Walmart, are among nearly half of the Fortune 500 companies seeking to locate operations in states with clean energy production due to fossil-fuel price volatility and pollution concerns“. Self generation and Net Metering is not for everyone. If fuel and electricity costs are a very small part of your cost of operations, you may have better things to do with your time and money. However, for those of you who worry about these costs or want to shave costs wherever you can, this is a great place to look because of the high prices for fuel and electricity in the ISO-NE region. You can’t do much about commodity prices, but you can find was to use less of their products by either by taking efficiency measures or using your own generation in the mix.